The combined effect of global trade crash and the growth of the world merchant fleet in 2008/09, resulted in an excess of transport capacity not experienced since the end of the Second World War. The collapse of freight rates, the loss of value of existing vessels and the drastic fall of the investments in new naval construction, were the most evident consequences of that situation. The strong recovery in world trade, from the second half of 2009, and public aids granted to shipbuilding industry in many sovereign states, have not yet been sufficient to boost investments in new shipbuilding. It is believed that a real recovery of Shipbuilding industry will take much longer. How to extend the construction range of our shipyard to more types of vessels? Or even for entering some of the most promising fields of modern oceanic technology? How can we transform fix costs of shipbuilding into variable costs? 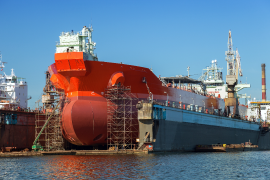 What could be done to improve flexibility, efficiency and cost effectiveness of our ship building processes? How could we synchronize shipbuilding planning and supply flow, to get a significant reduction of working capital? How could we redesign shipbuilding processes, to get significant reduction in the total times for preparation of ships? Organize and implement advanced process of Supplier Relationship Management to get, from suppliers, the maximum advantage in terms of, technology, logistics, sharing of the business risk, reducing working capital and the cost of ships. CBE partners with Shipbuilding Industry to address their most important strategic, operational, and organizational challenges. Our focus on delivering lasting competitive advantage has helped our clients succeed in an increasingly challenging marketplace.